Designs by Lisa Somerville: Whoo Hoo New Rubber! Look what came today - NEW RUBBER and accessories! 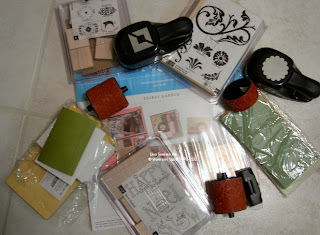 You know what that means - lots of new samples will be posted to my blog soon. I actually have a few I've done up quickly tonight - I'll post them tomorrow. Oh, I'm jealous. I so want those punches! I ordered the scallop but I have to wait on the photo corners punch. Can't wait to see what you do with all this new stuff!! I am green with envy! My is supposed to come tomorrow -- I will haveto live vicriously through you until then : ) Have fun - can't wait to see what you do!